Sorry to left handed users: Its asymmetrical design means only right handed users will be able to use it. Of course, I have yet to meet anyone who is left handed and use the mouse with their left hand, and it would be quite difficult to design a mouse with one screen for both left and right handed users. The overall design of the Cooler Master MM830 is standard. The body slopes up at the front towards the middle and then slopes down again towards the back. A design like this lends itself best to a palm grip, which the MM830 is excels at. It feels great in the hand and is easy to use this way. A claw grip can also be used, although it does feel slightly less natural. A bit of a departure from traditional design are the elongated primary mouse buttons. They stretch all the way from the front of the mouse right toward the middle. When I right-click, I can feel the button slightly lift against my palm, which is kind of cool actually. Where the buttons end, there is a bit of dip, sort of like a ridge, before the last big piece of plastic covers the back. In the middle of the back piece, we find the Cooler Master logo, which is one of the lighting zones. Another departure from the traditional design is a little wing off the left side of the MM830. It is comfortable to rest your thumb on here, and it makes it very easy to reach the hidden D-pad buttons on this side. Lastly, the MM830 is made from a combination of the more durable PBT and the less impressive ABS plastic. I am not sure exactly which was used where, but the entirety of the outside of the mouse is hard plastic with a bit of a matte finish. The side with the hidden D-pad is a soft rubber, which is really comfortable. It took me a while to get used to the hard plastic all over, because I have been using the SteelSeries Rival 600, which is mostly soft rubber. However, I do still like the feel of the MM830. As for the dimensions of the Cooler Master MM830, they are fairly standard. They come in at 82.2 mm in width, 130.1 mm in depth, and 43.4 mm in height at the largest point. These dimensions might be a little small for someone with large hands, but it should work great for most people. One of the first things I noticed when I pulled the MM830 from the retail packaging is its lightweightness, at least for me. I have been using the SteelSeries Rival 600 with as many weights included as possible, so I was used to a heavier mouse. I was surprised to find the MM830 is not much lighter. The exact weight, without the USB cable, is 122 g. For many, this is fairly heavy, which is understandable. I still found it easy enough to flick the mouse around in first-person shooters. Unfortunately, the weight cannot be customized. The main standout features of the Cooler Master MM830 is the OLED screen and the hidden D-pad. The OLED screen is located right next to the D-pad, which you can see in the above picture as that glossy and reflective bit. The actual screen is not the entirety of the glossy bit, but covers most of it. Through the software, what appears on the screen can be customized. The extent of the customization will be covered later in the review. The D-pad is a nice addition as well. I do not even need to move my thumb forwards or backwards to reach the buttons. I simply need to put more force forward, or up, or down, or back to actuate the buttons here. In practice, this is excellent. However, I will detail some issues I have encountered on the testing page. Otherwise, Cooler Master boasts some excellent hardware on the MM830. The two primary switches are Omron, rated at 20 million clicks. 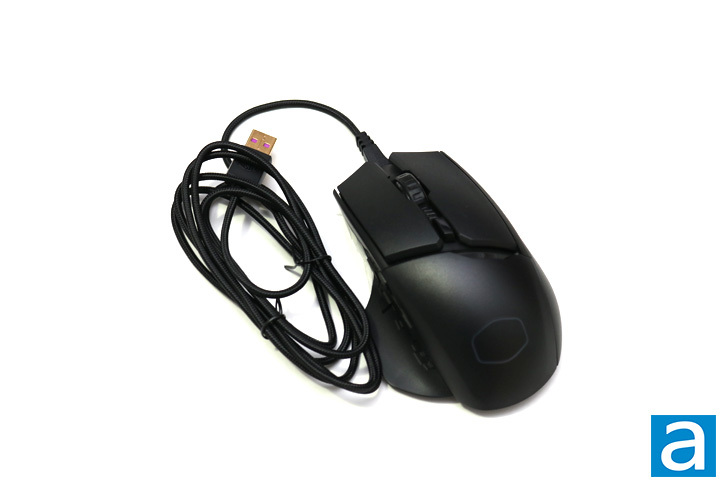 Omron is a popular and excellent switch found on mice and it is a great addition to the MM830. The scroll wheel has rubber to make it easier to grip, while there are bumps while you scroll. Furthermore, there is a central button which by default controls the DPI settings. 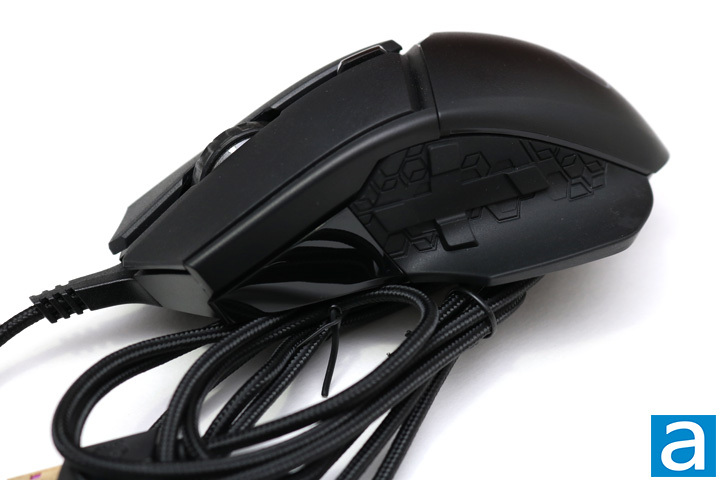 It is glossy and so is easy to distinguish between it and the other buttons on the mouse. The great hardware continues on the bottom of the mouse. The sensor is a PixArt 3360, which is great. The Cooler Master MM830 is advertised as having up to 24,000 DPI sensitivity, but that can only be achieved once the firmware is updated, otherwise the mouse is locked at 12,000 DPI. 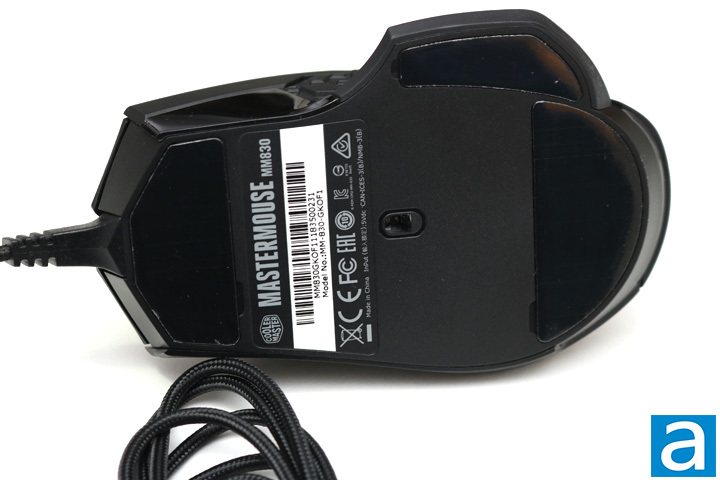 The sensor is located right in the middle of the mouse, as you can see above, and the sticker with some extra information is located above it. Inside of the mouse, we find a 32 bit ARM Cortex M0 processor and 512 KB of on-board memory. This is used to save profiles and process the few different functions of the mouse. Out of the top of the mouse, we find a 1.8 m long braided cable with a gold plated connector to add that touch of class. 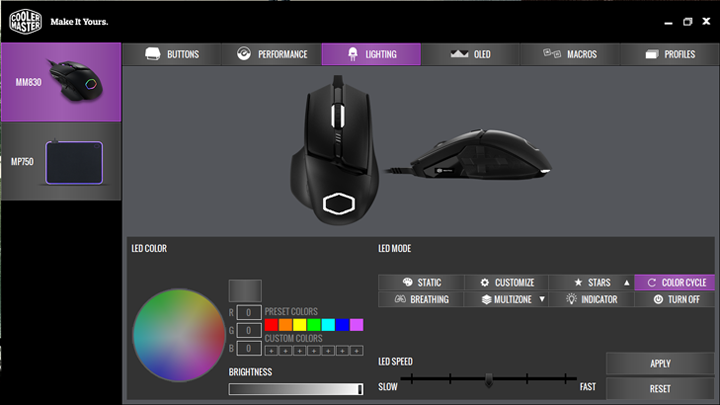 All of this is great and Cooler Master did well to include all of these features to make a great mouse on paper. The software is located in the Cooler Master Portal used for their RGB mousepads. This is a different piece of software that is used for their keyboards and such. Cooler Master does make it clear which software to download, which is appreciated. As you can see in the above picture, the Cooler Master MasterAccessory MP750-L, is located along the left to easily switch between different Cooler Master products. The first tab the software is open to is the lighting tab. This is to control all the LEDs on the mouse. Cooler Master provides some cool looking effects, with two I have never encountered before. They are named sky and star. Sky makes it so a white color illuminates different parts of the Cooler Master logo at random intervals. Part of the logo, a small part, will almost breathe with a white LED for a short while. Star does the same, except it turns off a part of the LED, making part of the Cooler Master logo dark. The lighting effects are mostly straightforward except for the lighting zones. I have no idea how they work and could not figure it out. As for the rest of the tabs, they are fairly self-explanatory. The performance tab allows one to adjust the DPI settings, lift off distance, polling rate, double click speed, OS sensitivity, angle snapping, angle tunability, button respond time, and surface tuning. One can help the software to learn what surface you are using it on to improve performance. This tab houses many features as you can tell and allows for extensive customization. The buttons tab is a view of the mouse and the different buttons located on it. These buttons can be programmed to control media, launch a few programs, and so on. The shortcuts provided are extensive and useful. One of the coolest features is the OLED screen, which has its own dedicated tab. The screen can display the profile you are currently using, lift-off distance, CPU usage, RAM usage, and even GPU usage. Furthermore, it can display an actions per minute counter, polling rate, current DPI, system volume, and then there are some game genre functions too. The genres listed in the software are first-person shooters, mutliplayer online battle arenas, and massively multiplayer online role-playing games. This only displays a certain icon on the screen. I did not notice it do anything else. You can even customize what is displayed on it. A small bitmap image can be uploaded at 96x24 size. You can draw something on the grid they provide too. Cooler Master has really filled up their software to the brim when it comes to what you can do with the MM830. The macros tab is easy enough. You can record macros and assign it to the different buttons on the mouse. Finally, a profile tab allows one to import profiles and switch between the different ones already customized. Overall, the software for the Cooler Master MM830 is extensive and allows for excellent customization. posted 5 hours and 11 minutes ago, with 15 posts.